In 2011, natural hazards caused over $52 billion in damages in the United States. Most of this cost occurred in the residential sector because a large number of houses were unable to withstand severe weather and geological activity. Th is is an investigation of construction methods and design characteristics applied to new and existing homes in order to better support residential wooden structures against natural hazards. Th e focus will be on two locations because of their affinity for natural hazards: Anchorage, Alaska and Houston, Texas. Anchorage is prone to flooding, heavy snow, permafrost, earthquakes, tsunamis, wildfires, coastal erosion, and nearby volcanoes. Houston standing at fourth on the list of cities with the greatest risk for natural disasters is subject to hurricanes, flooding, tornados, subsidence, hail, and wildfires. Having utilized online mitigation sources, government agencies, and specialists, I have compiled the information needed to understand the dangers of living in harzard-prone areas. 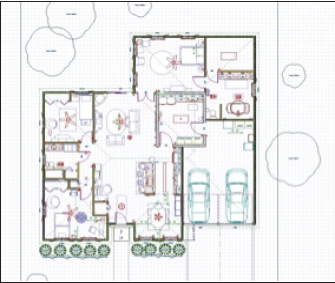 Floor plans have been designed for these two U.S. locations to explain the techniques and products needed to create a hazard resistant home. Along with a floor plan, a list of materials and construction methods will be provided. In 2011, more than $50 billion was lost to damages from 99 federally declared natural disasters in the United States ranging from hurricanes, tornadoes, earthquakes, floods, fire, and similar events (Pidot, 2013 Ruckversicherungs-Gesellschaft, 2011. This cost was deeply felt within the residential sector, as many homes succumbed to contaminated floodwater, were deemed structurally unsound as a result of the shifting ground below, or were demolished by winds in excess of 200 miles per hour. Hundreds of lives are lost every year to such terrible events; thousands more are affected by the financial, emotional, and societal distress that follows. The failure to evacuate, ill-equipped and unprepared communities, the choice to live in a dangerous location, and inadequate or ineffectual building codes and mitigation techniques that cannot stand up to the hazards of the area, are just a few reasons for the rising disaster price tag in the United States (Pidot). With over 90 million homes in the country, a substantial percentage of the cost of disaster recovery could be alleviated by simply educating homeowners and builders on disaster resistant construction techniques and products designed for their area. This project is the study of techniques and products readily available for two hazard-prone areas: Houston, Texas, and Anchorage, Alaska. Houston and Anchorage were chosen because of their affinity for severe natural events and the vast differences in climate, population, and location. There are three aspects to a disaster: severity of the event, resiliency of the communities affected, and population (Hyndman & Hyndman, 2011). The severity of the event reflects the strength of the natural forces at play. An earthquake above 7.0 on the Richter scale, and a category 5 hurricane, are examples of severe hazards. While such high-level hazards are rare, natural disasters are not. Resiliency is the ability of a community or communities to recover from a natural event. The inability to protect and evacuate citizens, the destruction of structures because of inadequate building codes, and a lack of post-disaster recovery plans are factors that can contribute to a slow return to normalcy after a disaster. Such factors are common in less developed countries, as they lack the financial and governmental stability to create and activate a disaster plan properly (Stromberg, 2007). The population affected determines the true meaning of a disaster. The extremity of a disaster is the balance between the numbers of people affected and the amount of damage, so a lesser event in a highly populated area can be the same level of disaster as a major event in a less populated area. An earthquake in Los Angeles would be called a natural disaster; it would be a severe event affecting thousands of people and buildings, and it would take considerable time to rebuild and return the city to normalcy. The movement of the earth itself is a natural hazard; the event, including the people affected or killed, the cost of damages, and the recovery process is the natural disaster (Hyndman, & Hyndman, 2011 Kusar, 2008. Given this terminology, we might ask: “What if we manipulate the three aspects?” We could lessen the severity of flooding by not damming or leveeing rivers. We could try to redirect population growth to cities away from the Gulf Coast, which is consistently battered by hurricanes. Finally, for the easiest avenue of change, we could build homes and businesses to better withstand the forces of nature and drastically reduce rebuilding costs, the number of lives lost, and recovery time. While modern codes account for the natural hazards, they can still fail in extreme situations. Lack of education about alternative protection techniques is common among consumers and builders in some of the most dangerous areas in the United States. The result of this study is a list of improvement options to strengthen homes for citizens in both areas of study. The home seen in Figure 1 is the basis for all additions that will follow and should be able to withstand the hazards both of Anchorage and Houston. There are hundreds of economically efficient and rather simple ways to prepare a home for danger, but lack of education and the “it will never happen to me” mentality hinder consumers from making vital decisions about buying, building, and remodeling a home. When it comes to preparing for natural disasters, people must make important decisions. Not all locations will have the same level of danger from every hazard, and not all hazards are worth preparing against. Ultimately, the forces of nature are unpredictable, unrelenting, and deadly. Hazards such as tsunamis, volcanoes, and sinkholes are examples of events that can only truly be prepared for in the initial site planning. It should also be noted that the features explained below are suggestions to give a home a better chance, but there are forces that cannot be economically combated at the present time. The foundation is the base of a house. If the foundation fails, the house is less likely to survive the duration of the event. Foundation repairs are also extraordinarily expensive. Because of this, the foundation is a vital part of preparing the home for natural hazards as well as keeping the house standing for as long as possible. As shown in Figure 2, a post-tension slab, a type of on-grade concrete and steel foundation, has been found to sustain less damage from ground movement (Reichel, 2013). This type of foundation is suggested for both Houston and Anchorage due to the unique soil movements in those locations. In Houston, most of the soil is made up of expansive clay that can shrink and swell with water intake as well as have issues with water subsidence (Hyndman & Hyndman, 2011). This causes problems as the clay below a home expands at different rates; the slab can be pushed and pulled in different directions, causing cracks in brickwork and the foundation. 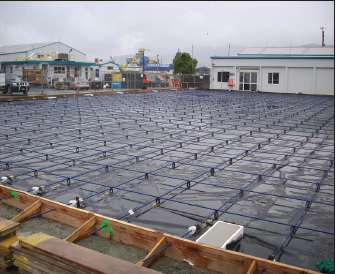 A post-tension slab is an on-grade concrete slab with steel cords that are pulled partially through the slab during the cement curing process to increase the tensile strength of the concrete. This process reinforces the concrete foundation to protect against soil movements such as shrinking, swelling, and earthquakes (Rogers, 2008). Anchorage has a similar but different story. The soil movement in Alaska is affected by earthquakes and the freeze-thaw cycle of permafrost. Whereas Houston deals with the vertical movement of shrinking and swelling clay, Anchorage has the same vertical movement of permafrost in addition to the more violent sudden horizontal and vertical movement caused by earthquakes (Hyndman & Hyndman, 2011). The post-tension slab combats this while the additional strength added to the concrete prevents it from shaking. Another alternative foundation suggested for these areas, both of which are prone to flooding, is a raised slab to lift the home above the base flood elevation. However, post-tension slabs are a more effective measure to protect the foundation. The framing of a structure is similar to the skeleton of the human body. It is the second step in building a home and provides the basic setting for the rest of the home. Most of the strength of the house will depend upon the framing and the techniques used at this stage in the building process. For Anchorage, structural insulated panels (SIPs) are suggested to best combat the movement of earthquakes. SIPs are precut wall sections made of two sheets of oriented strand board (OSB) with Styrofoam insulation in the middle (Structural Insulated Panel Association, 2013). This form of framing is rising in popularity, as it is easy to install, a good insulator, and resists swaying better than traditional framing alternatives (Reichel, 2013). If traditional framing is used, horizontal bracing should be installed for a similar effect. Although SIPs are also used in Houston, it is suggested to simply build with treated advanced framing and closed cell spray foam insulation. Advanced framing is a newer type of framing that uses 2”x6” studs, 24” on center, as opposed to the traditional use of 2”x4” studs, 16” on center (Krigger & Dorsi, 2004). This seemingly small change allows for thicker walls, creates more room for uninterrupted insulation and a larger buffer from the outside, and uses less wood. However, while most of these benefits are similar to those of SIPs, the important difference is the type of insulation. Closed cell spray foam is suggested for Houston because it also serves as a vapor barrier, which keeps water from reaching the wood studs and causing mold. A wet-flood proofing method minimizes damage regardless of the water inside the home. This makes for easy recovery after the flood waters recede, as the water will sit against the vapor barrier and not damage the home framing. With this method, all that would need to be replaced after floods is the drywall covering (see below). Closed cell spray foam insulation is also resistant to bugs and protects studs from termites that can severely damage homes in sub-tropical climates (Reichel, 2013). Connectors are long metal straps screwed onto vital joints throughout the house in order to secure each piece of the wall together. The straps protect against swaying of the house and external pressures such as wind, water, and ground movement. In both Anchorage and Houston these straps, which secure the house to itself and to the ground (Figure 3) are suggested for two very different reasons (Federal Emergency Management Agency, 2011). 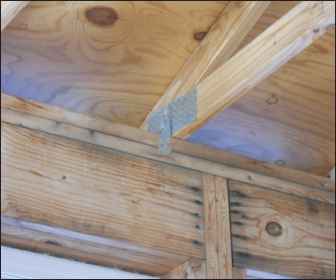 Hurricanes, storms, and tornadoes in Houston and other parts of southeastern Texas make use of specific connectors called hurricane straps that brace the roof of a house to the frame. During high wind situations, the home is exposed to extreme pressures from outside that push at the exterior walls, testing the doors and windows as the pressure attempts to move inward. If at any point this seal between the exterior and interior is broken, the wind pressure enters the home, becomes trapped, and is forced upward. If the roof has any weaknesses, the uplift from the wind will cause the roof to blow off the house. Once the roof is gone, there is nothing left to hold the structure together as the storm continues and it will inevitably rip apart, leaving nothing but the foundation (Hyndman & Hyndman, 2011). The additional fastening of hurricane straps prevents the roof from flying off in high winds once the seal of the house is broken and can save a house from destruction. Anchorage has a much different story for its connectors. Although the city has high winds, earthquakes are a larger problem. During earthquakes very different forces are exerted as homes must resist horizontal and vertical movements as opposed to inward pressures. These forces can be combated at the foundational level with proper bolting of the home to its foundation; otherwise, the structure will in essence bounce off the foundation and crash into the ground. Proper bolting is also useful in flood zones to keep the house from floating. The wall connectors are important to resist the swaying of the house during the horizontal motion of seismic waves. Simple nails, common in framing, can easily pull out and crack walls because of their angle of motion. The use of screws and connectors can keep walls structurally sound and prevent them from falling in on the residents (Hyndman & Hyndman, 2011). Drywall is a necessary home-building material with few alternatives. However, it is important to understand the best types of drywall to use if flooding is an issue. Part of the cost in flood recovery is replacing wet and molding drywall, but there are ways to reduce the amount of drywall that needs replacing. There are three types of drywall that can be useful in both Anchorage and Houston flood zones. The first is regular drywall; it is white and made of gypsum and paper. This type has the sole purpose of finishing the walls with a smooth surface. However, this type is very susceptible to water, stains, and damage. Mold-resistant drywall is the second type; it is commonly used in kitchens, baths, and laundry areas as they are most likely to have water in the air, walls, and floors. Mold-resistant drywall is, as its name suggests, less likely to grow mold given minor spills, floors, and water vapor in the air (Krigger & Dorsi, 2004). However, when this type is inadequate, paperless drywall is an option. This type has no exterior paper to soak up water and will better withstand flooding. Although the walls are not as smooth as traditional drywall, paperless drywall can save money by avoiding drywall replacement after a flood and can be painted and used in the same way (Reichel, 2013). Different types of drywall installation can also be considered in flood preparedness. When installing drywall in a home that has a potential to flood, it is possible to install it an inch or so above the finished floor in the space that will later be hidden by the baseboard. Doing this will allow a minor flood or spill to wash over the floor and not damage the drywall, which soaks up water and can mold if not addressed immediately. In anticipation of large floods, one can install drywall horizontally and leave a gap between the bottom drywall sheet and the top drywall sheet so that only the bottom sheet might require replacement. A chair rail or other wall decorative accent can cover the gap and save a homeowner half of the cost of drywall replacement (Reichel, 2013). Post tension slabs sustain less damage from ground movement. The garage is the largest opening in the house and as such proves a vital point to protect during a hazard. During wind hazards it is common for garage doors, which have little bracing built in, to be blown inward, breaking the seal of the house. After the integrity of the door is broken, the small remaining wall area rarely can hold up the weight of the roof, resulting in the roof’s collapse (Gurley & Masters, 2011 Hyndman & Hyndman, 2011. During earthquakes it is also typical for the garage to crumble and allow the roof to collapse. To combat this, impact resistant garage doors can be used as an alternative to traditional doors or hurricane bracing can be installed onto the current garage doors. Additional framing on the walls to support the roof after the door is gone can increase the strength of the structure and keep the garage and attached house intact (Reichel, 2013). Seismic ties secure the house to itself and the ground. Roofing materials have a large role in preparing for natural hazards. In Houston, the type of roofing is very important for a number of reasons. During hurricanes and tornadoes, high winds can rip up shingles, transforming nails and asphalt into projectiles (Gurley & Masters, 2011 Hyndman & Hyndman, 2011. In times of extreme heat, a light colored roofing material serves as better reflector of the sun’s rays, keeping the interior of the home cooler (Krigger & Dorsi, 2004 ). In addition, Houston is known for its hail, which can severely damage weaker roofing and puncture the roof, requiring costly repairs and patchwork. However, all of these issues are solvable with proper installation and knowledge of products. Stone, terracotta, and metal stand up well against the impact of debris and hail; however, such options are very stylized and expensive. The best alternative for an average home is proper nailing of impact resistant shingles that are made of a harder material and can withstand continual battering of the roof (Insurance Institute for Business and Home Security, 2012. Anchorage does not have hail or much debris due to high wind; however, snow load and occasional ash load from the nearby volcanoes can be issues. Therefore, a lightweight material is suggested because it will not place as much stress on the roof (Federal Emergency Management Agency, 2011). Darker materials also absorb heat in the colder winter months to help keep the house warm and use less energy. In both locations, a hip roof is suggested, as it is the most aerodynamic roof shape (Krigger & Dorsi, 2004). 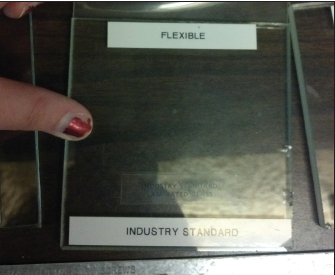 Davis holds a sample of impact resistant window material. Siding varies greatly in Houston and in Anchorage because of the soil movement. In Houston, where the greatest threat is wind and water, masonry is suggested because of its strength and stability (Reichel, 2013). If built on proper foundations, brick or stone veneer will withstand the minimal movements of expansive soils and hold better against flying debris and wind during storms. In Anchorage masonry and stone are advised against because of earthquakes. Such violent movements crack and weaken masonry and make it more likely to fall, which can be deadly to any resident or bystander (Hyndman & Hyndman, 2011 Kusar, 2008. The lighter weight, more flexible vinyl siding is recommended since it is less likely to break or create dangerous falling objects (Insurance Institute for Business and Home Security, 2012). This laundry room doubles as a safe room in disguise. Falling chimneys are common in hurricanes, other strong storms, and earthquakes because they are made of masonry, are heavy, and often are poorly attached to the house. To solve these issues additional bracings can be bought and installed cheaply and easily. During initial construction, chimneys can also be reinforced with steel and designed to be short and wide, as opposed to tall and narrow, which will reduce swaying and pulling on the house (Federal Emergency Management Agency, 2011). If flooding is a possibility, waterproof flooring such as sealed laminate, stone, or waterproofed wood is suggested. These choices will survive most influxes of water, whether moving or stagnant, clean or contaminated, and will greatly lessen cleanup cost and time. If soft flooring is still desired, rugs or other removable coverings are suggested because they are cheaper to replace and do not require invasive removal when damaged (Reichel, 2013). To protect wiring from flood waters, raise up all floor outlets to approximately three feet above the finished flooring. This should move all wiring above the base flood elevation, and making it easier to reach is an added bonus (Reichel, 2013). Additional braces should be installed for all hanging light fixtures to secure them during an earthquake. Chandeliers and pendants often are made of glass and metal, which, if shaken loose, can be very dangerous to anyone standing around them as well as expensive to replace (Federal Emergency Management Agency, 2011). The use of generators is common after disasters because of power outages. Generators should be placed outside, at least 25 feet from the house since a malfunctioning generator can leak carbon monoxide (Krigger & Dorsi, 2004). Fire alarms and CO detectors should have battery backup in case of power outages. Cross-linked polyethylene (PEX) tubing is the best choice for locations prone to soil movement since it is a flexible plastic that will not break. As a plastic product, it will also be less likely to freeze than the more commonly used material, copper. Insulating pipes is very important in cold climates. Inside the house, the thicker the insulation the better it is, but outside heat tape is best to prevent pipes from freezing. In areas prone to freezing for much of the year, such as Alaska, it is suggested to keep all water inside the conditioned zone of the house (Kecebas, 2013). A gate valve is an emergency block inside the piping to prevent water from reversing direction and flowing back into the home. This valve on the main sewer line, particularly one which is automated, can prevent back flow of water during floods (Reichel, 2013). The safe room is in the center of the house. The room may look and function like a laundry area, mud room, or closet, but there is much more underneath. The safe room is built with reinforced walls and all the supplies needed to survive a natural disaster, even if the rest of the house is not accessible. It also serves as an emergency center for the family, as it contains all items and controls needed during any disaster. For this project two different safe rooms are described, applicable to both Anchorage and Houston hazards. The difference is the price: the more amenities and the stronger the construction, the more expensive the room will be. This additional cost has to be taken into account by the consumer and balanced with the benefits and peace of mind that comes with this exceptional tool to protect a family (Federal Emergency Management Agency, 2013). 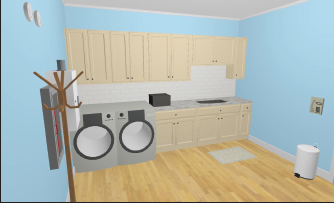 Laundry: to avoid the safe room’s being just a limited use space, the laundry and storage area has been built into the safe room in the house design shown in Figure 1. It is clear from Figure 5, a perspective of the design, that the space looks like any other room in the house. Floor space: the safe room needs to accommodate all residents. The safe room in the sample plan has floor space to quarter the residents of this three bedroom house comfortably for a short amount of time. Sink: allows for running water into the room if the family needs to stay there for long periods of time. Food and utility storage: provides additional storage near the kitchen and allows easy access to canned or dried food during stays in the safe room. Fire rated door with lock on inside: protects the area and its contents in case of a fire or in case of home invasion. The residents can lock themselves in the room until it is safe. Fire doors also are impact resistant. Landline telephone: landline phones still work during power outages and, unlike cell phones, do not need recharging, thus usually can still be used during high-volume times. Storage Safe: a safe within the strongest part of the house best protects and keeps secure important documents like birth certificates and deeds, or valuables like jewelry and antiques. Family disaster kit: this kit has all the items and information needed to cope after a disaster such as additional medicine, pet necessities (if required), extra clothing, cash, copies of insurance(s), and emergency phone numbers. For a full list see Federal Emergency Management Agency website, http://www.ready.gov/build-a-kit. Electrical panel/water/gas controls: it is suggested to have all the main breakers in the same location within a house, in or near the safe room, for convenience and safety. Tankless water heater: including the water heater, all utilities are within a single room; because it has no tank, there is no risk of its falling over during an earthquake. Center drain: as with most laundry rooms, a center drain is recommended for interior floods, but this also helps drain any other water that might come in. Fire extinguisher: this gives residents the ability to fight a fire. The best location for a fire extinguisher is near the kitchen. Natural hazards occur every day, but whether the hazards cause a disaster is up to us. Earthquakes and hurricanes rarely kill people; it is the buildings falling on their occupants that results in death.It is important to remember that nature is not out to attack us as a species, but our progress is getting in the way of nature. In order to live peacefully we must accommodate, and one way to do so is to promote better building practices that can withstand the forces of nature. Simple steps such as educating contractors and consumers about alternative products and building techniques to build a safer home can save money, time, and lives of families in dangerous areas. As natural hazards increase every year, these substitutes become less of an option and more of a necessity to protect the household (Stromberg, 2007). People in Florida, Los Angeles, and New York City spend thousands of dollars on repairs, replacements, or rebuilding every few years because of extreme weather and natural earth movements, but this can be avoided with additions that contribute minimally to the total cost of the home. As a result, residents could live in a safe home without worrying about natural disasters in the area destroying their investments. Federal Emergency Management Agency. (2011) Homebuilders’ guide to earthquake resistant design and construction, FEMA 232. FEMA, Washington, D.C.
Gurley, K. and Masters, F. (2011). Post-2004 hurricane field survey of residential building performance. Natural Hazards Review. 12, SPECIAL ISSUE: Hurricanes and Insurance, 177–183. Hyndman, D., & Hyndman, D. (2011). Natural hazards and disasters. (3rd ed.). Belmont, California: Brookes-Cole, Cengage Learning. Krigger, J., & Dorsi, C. (2004). Residential energy: Cost saving and comfort for existing buildings. (4th ed.). Saturn Resource Management Inc.
Reichel, C. (2013, January 20). Interview by C Davis. Building homes for natural hazard prone areas. Cara Davis is an alumna from Covington, Louisiana. She wrote this paper while pursuing her B.A. in Apparel, Housing, and Resource Management. After graduating, Cara found a career with Green Home Solutions, a green building and remodeling company in Seattle, Washington. She would like to thank Dr.Kathleen Parrott for her help and support throughout this project.